I’m sitting in Indianapolis Airport right now, ready to fly back home to California. I got here plenty early, so I figured I’d just write my last post while I am waiting. A friend of mine had recommended this course to me because it is known as a very challenging track. It was probably not the best one to end on given how worn out I’ve been the last few days, but oh well. 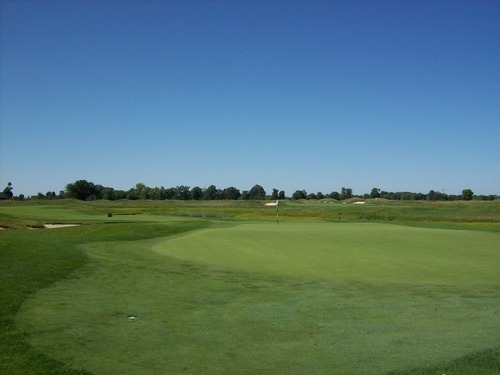 Purgatory (the golf course) is located in Noblesville, about a half-hour north of Indianapolis. I came back to where I started to squeeze in one last morning round before flying out this evening. 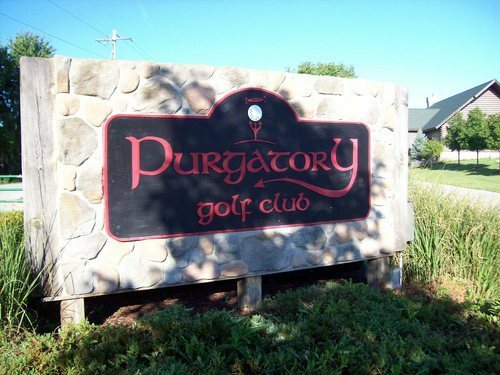 The name Purgatory would imply the course is somewhere between Heaven and Hell, so that intrigued me. The Hell would represent the challenging layout. The Heaven would be the quality and beauty of the course. I’m not sure it really lived up to those kinds of descriptions, but it was definitely a fun course. 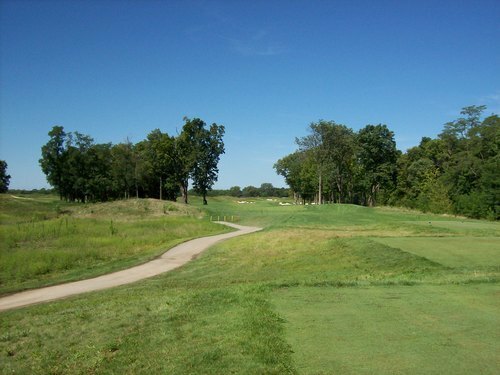 Now, the challenge is definitely relative to which tees you play and how well you are hitting the ball. 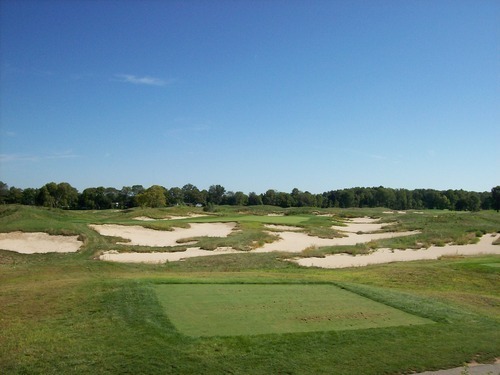 As you’ll see in the pictures, the intimidating part about this course is the bunkers. They are rugged, nasty and plentiful. 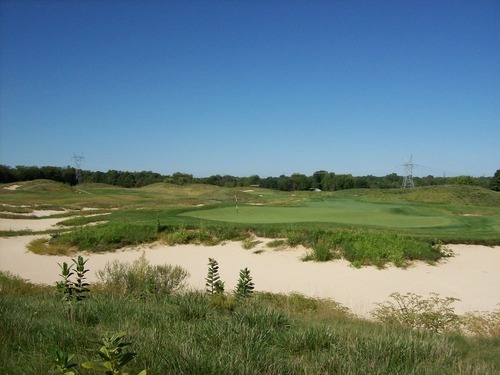 But if you can stay out of those and the long native grasses around the holes, the course can actually be more forgiving than I was expecting. Regarding the tees, that’s where you can really crank up how tough you want your experience to be at Purgatory. 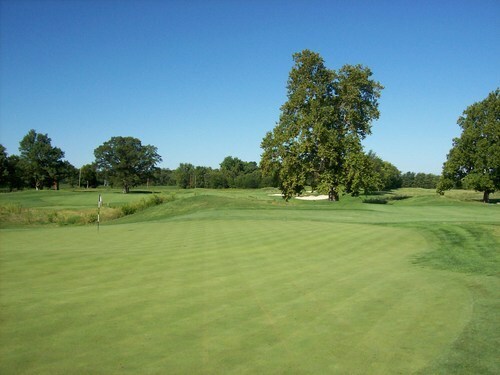 There are standard blue tees (which I played) that are pretty long at over 6,700 yards. 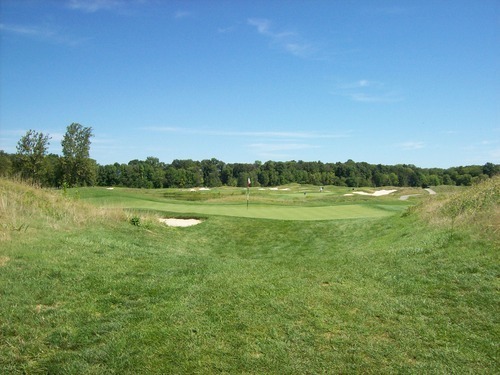 There are black tees, which are extra long at over 7,200 yards. But those aren’t the “tips” because there are Devil-red tees that play from a massive 7,700 yards! 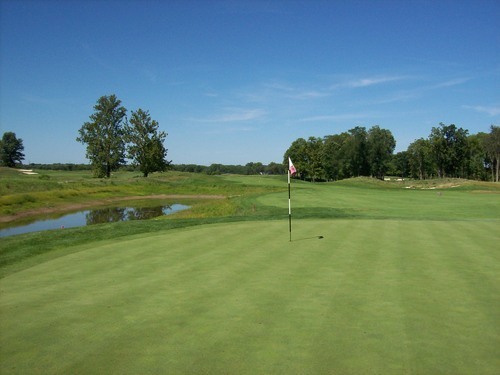 There are whites, greens and yellows forward, as well, so there are tee boxes to suit all skill levels and the scorecard recommends which tees to play based on your handicap. For example, the reds are listed for players who have a plus index. On the long par-5 13th hole, there are two different red tee boxes depending on how evil they want to be to you that day. The “normal” version is a measly 624 yards. The “ridiculous” version is a whopping 741 yards! 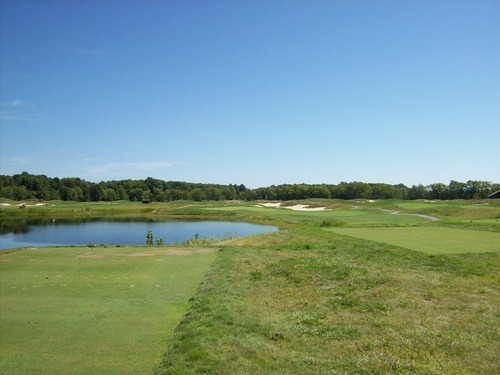 The card still says it’s a par-5 at that distance, even though that should probably constitute a rare par-6 hole. 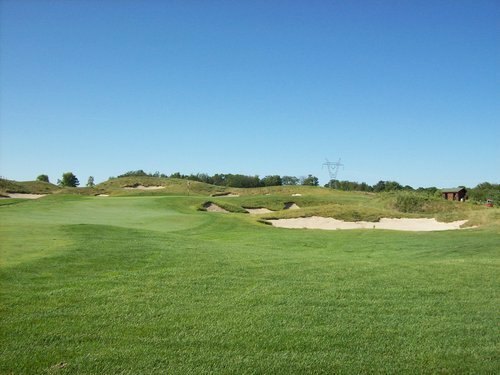 The course itself is pretty flat with the bunkers and some mounding creating the only real elevation shifts on the course. 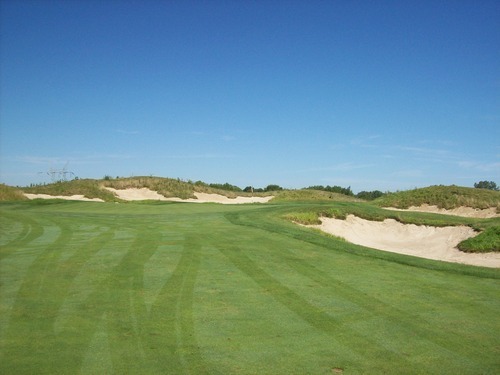 It’s a prairie links style layout that reminded me a lot of Wild Horse in Nebraska. 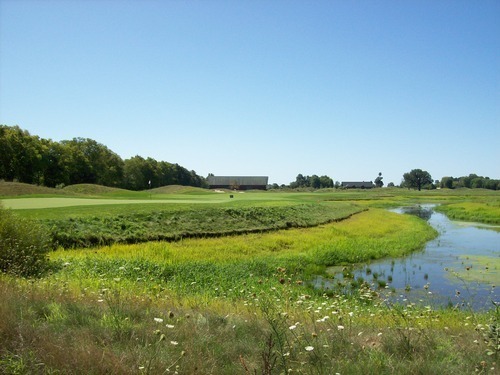 Rural farmland surrounds the course and reminds you that you are definitely in the heart of the Midwest. Wild Horse was much better conditioned and a little less rough around the edges, but the style is very similar. Condition-wise, Purgatory was in decent, but not great, shape. The fairways had a number of dead patches, and the greens were still recovering from some recent aeration and were a bit bumpy. One interesting thing about Purgatory is that when they gave me my cart, I noticed it was equipped with its own rake. I’ve never seen that before, but it’s a reminder right from the start that you will be in some sand before the day is through. 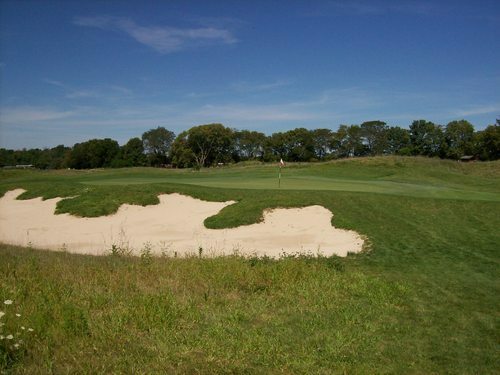 At first, I thought it was a great concept so there’s no rakes strewn about the course (especially with so many bunkers). However, there’s a fatal flaw with the plan because I noticed a lot of footsteps in all the bunkers. Nobody seemed to rake after themselves here because you tend to forget to bring the rake with you when you grab your clubs. 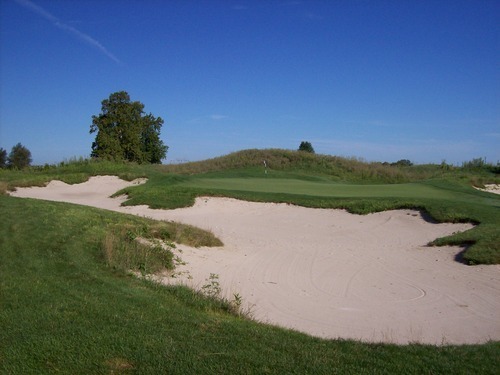 I was good about the raking in the fairway bunkers, but where I failed a few times was around the greens. That’s because most places where you park the cart are kind of far away from the greens. So it’s second nature to just grab your putter and wedge and not think to grab a rake (even if you know you are in a greenside bunker). 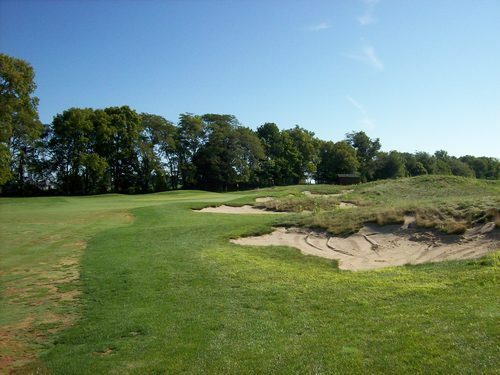 Then by the time you are there with people waiting behind you to hit, you don’t want to have to go all the way back to the cart to grab a rake (especially when the bunker is already full of other people’s footprints to begin with). I also notice a number of carts that didn’t even have a rake on board, so in the end I realized it was not a good plan. Good concept, but poor execution. 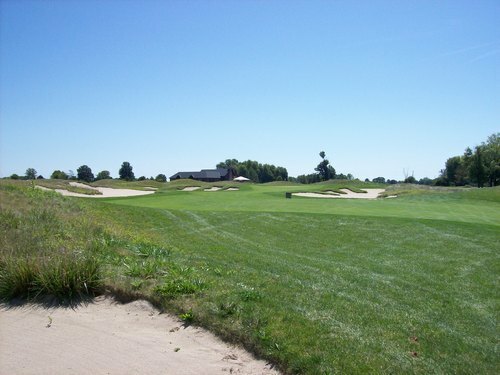 From the blue tees, the course still played long, but I found it to be more forgiving than expected. 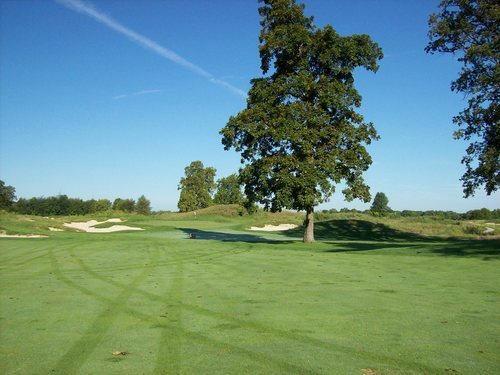 Most of the fairways are pretty wide and the bunkers can be avoided with smart play. 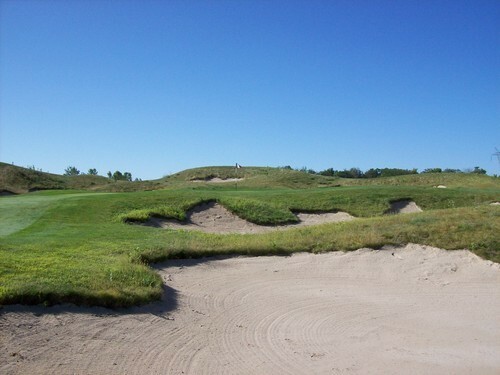 Don’t get me wrong, because if you come to Purgatory, you will have at least a few shots from the sand. I did like the sand here. It’s a very coarse grained sand, so the ball doesn’t plug. It’s firm enough to hit from on fairway bunker shots and it’s soft enough to explode out of on greenside shots. One ironic thing is how I ended up playing as a single. I had a tee time set at 10:00, but I got there early just in case I could get out a little sooner and give myself a little extra breathing room in getting back to the airport with ample time to spare. Unfortunately, I ended up in golf’s version of Purgatory as I was a single sandwiched in between other groups. They ended up letting me play off the back nine, but I was stuck behind one twosome and had another twosome behind me. Neither seemed interested in joining up, so I just stayed stuck in between at an awkward pace for a single. When I circled around to the front nine, I caught up to another twosome and joined up with them. We were stuck behind a few groups, but playing with other guys helped things move along at a better flow. I ended up liking the front nine better. It was a little more scenic with more trees and a number of water hazards. 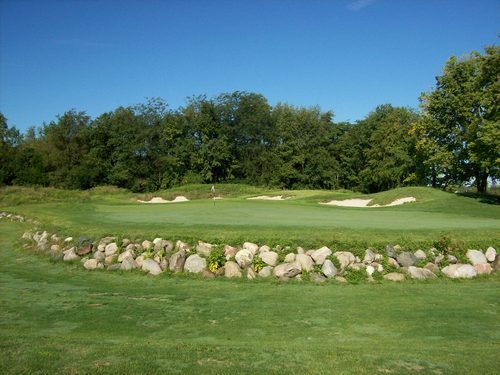 The back nine is more desolate, culminating in the signature 17th hole which is guarded by a labyrinth of gnarly looking bunkers all around the green. I wasn’t blown away by Purgatory, but it was a fun change of pace and definitely different than other courses played on this trip. It’s worth stopping by if you are in Indy, but I wouldn’t go too far out of my way to play it again. 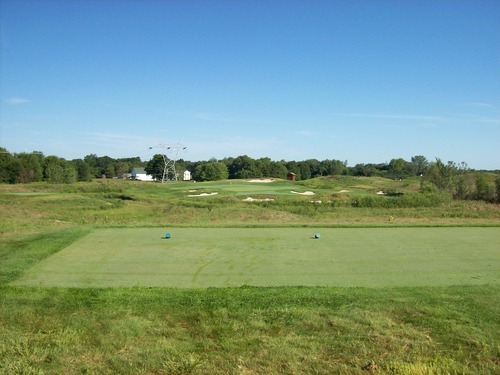 Only reason I would is if I was feeling extra sadistic and take on the 7,700-yard red tees. I’m sad to see the trip to come to an end, but I am also very happy to be going home. This has been an exhausting week, but the golf has been amazing, the weather has been very nice for the most part (by the way, today was absolutely perfect!) and it’s been a lot of fun exploring this part of the country even though I didn’t get to stop and enjoy much other than golf. At some point next week, I will have a “summary” post to review this trip and hand out my personal awards based on a variety of different categories. Until then, this is the Golf Nomad signing off from yet another incredible golf adventure.